Take pictures of lots of simple regular things that are included in christmas in your family. 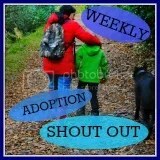 I actually think the pictures I use are a bit naff however from a child perspective they serve as useful reminders! 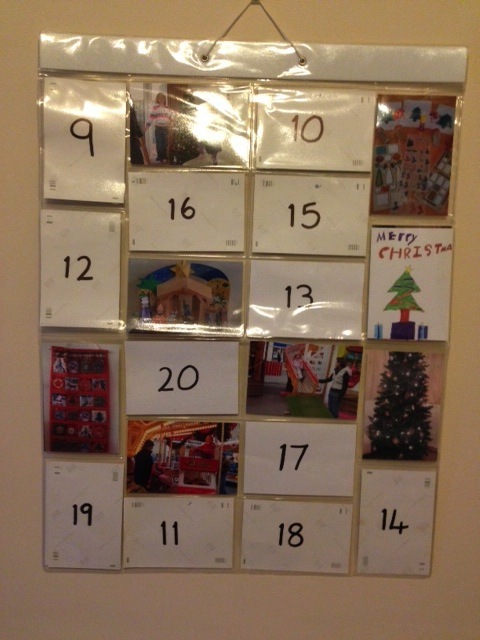 The pictures we have include: making cards, sausages wrapped in bacon, a pile of xmas tree chocolates, christmas crackers, the christmas tree, some wrapped pressies, cards hanging on the wall and an advent calendar. The first year I just wrote numbers on the back then stuck them picture side down on the wall with blutack. Then the girls turned over one each day. In later years I’ve got more organised so have got one of those plastic hanging picture pockets. It comes out every year now and they still seem to need and welcome it. My mum bought us an Usborne Christmas book which not only had the proper Jesus story in it, at young child level, it also had a little card nativity model in the back of it. Getting the kids to put this up each year has become a family tradition which they like. I still keep reading the story to them. It adds a tradition and good memories. Of course, I also add in little anecdotes about how we can see that baby was so loved and looked after carefully; made comfy and warm in the manger; how all babies are so gorgeous and lovely that people have always wanted to come and see them. I have found that this helps them because they believe or used to believe that they were bad and ugly when they were babies. Such a shame but when mindful of the attachment cycle it makes sense and so I take every opportunity I get to reframe their thoughts. In town every Christmas there is always a little fayre with a helter skelter slide and a couple of other things. It is only there at Christmas, so when they much younger I used to take them each year and let them have a go on that. They began to remember that as something they do at Christmas. Once they got bigger we changed that and I used it to explain and reinforce that sometimes in life some things stay the same and some things change. My mum made my girls a fabric pocketed advent calendar so each year we put chocolates in the pockets and that makes them feel special and adds tradition of something which is their very own. We learned the hard way! Our very first Christmas was simply awful! Full of tantrums, terror and trauma. We very quickly realised that Santa had quite a lot to do with it and he was most definitely a bad and scary man. The best we could do was for them, that first year was to leave their presents in the porch (thank goodness we had a porch!!). Over the years we discovered just what a bad man they think he is and what terrible things happened in their birth family. So he continued to be scary and we could not even put up cards with a picture of him or mention his name. Therefore the truth about Santa and where present come from was revealed early on and he is now firmly referred to a “that bloke” and banished from our house for ever. I never cease to be amazed at what will bother them. This year, as well as “that bloke” we also had to deal with Herod! My little J came home from school a bit upset the other day. Through lots of exploring we discovered that in an RE lesson they had been learning about Herod. She had a very disjointed idea of what happened and I can only surmise that she became so distressed that someone was going to kill the baby that she “missed” a good part of the lesson by being caught up in her own thoughts and worries. So I needed to tell her (at an appropriate level, of course) the story of Herod and Jesus. Needless to say, it included lots of “safe” words and ended with some comments about how Mary and Joseph were such safe parents that they did everything they needed to, to keep baby Jesus safe – just like we do for you! Each Christmas-time does get better each year and so I firmly believe we are doing the right thing. I wouldn’t want Christmas to happen more than once a year but I do feel it would be useful if we could have a few more chances to work on the reframing and re-learning!! I often wonder what age my girls will be when we are able to have a Christmas without trauma.